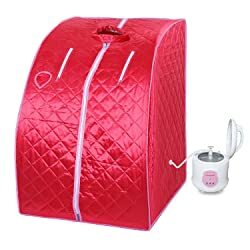 I am quite sure that you are here because you want a portable sauna for your personal use right at home or when traveling. That’s great! And rest assured that you are a step closer to leaving a healthy life. Our job is simply to help you choose the best portable saunas for your use quickly. These products will help you to lose weight, remove toxins from your body, and make you feel stress-free and relaxed. But do you know the model of sauna you want? Here is an article to help you through. 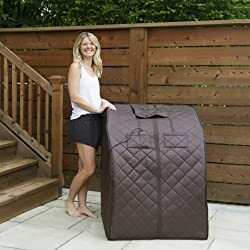 2 How to Use Portable Sauna? 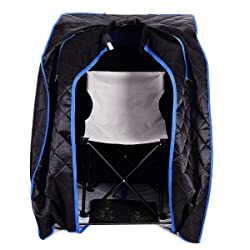 3 How to Fold Portable Sauna? 4 How to Clean Portable Sauna? 5 How to Clean a Portable Infrared Sauna? 6 How Much is a Portable Sauna? Below we have reviewed the top 10 portable saunas that will make your life healthier. The KUPPET 2L Portable Folding Steam Sauna comes with thicker fabric that thwarts the heat from escaping. Also, the inner layer of the sauna is waterproof, enabling you to enjoy a better slimming effect. The model has a double-sided zipper that makes it easier to close and open it when you are done. It allows you to put your neck and hands out when adjusting your body. 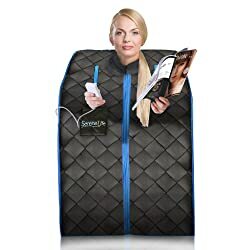 Another thing, the portable sauna comes with a pocket where you can put your phone, remote, and any other thing. It is also one of the easiest and most convenient to use saunas on the market today. Thanks to the remote control, you can easily adjust the temperature and time by yourself. The model allows you to choose a time range of 20, 40, or 60 minutes and the temperature is preset at 6 grades. However, most people prefer 4th grade but you can choose your preferred grade. Its’ steam pot can go off automatically if the liner has dried up – there is no risk of fire that can hurt you or your family. Durasaga Lightweight Portable Sauna has a detachable frame which makes it simple to assemble and disassemble for storage. It is a product that you can carry from one place to the other with ease. The model comes with a strong 800w steam generator that you can set to run for 60 minutes with its time. And setting the time and temperature is very easy when you follow the provided instructions. Another feature of the model is the two zippered openings that allow you to remove your hands if you want to use other devices. You can even read a book when relaxing in your portable sauna. Easy to use, you can conveniently use the sauna as a personal gear at your home. And it comes with everything that you will need to assemble it and enjoy the warm environment. Besides, it is an affordable model when you compare it to most models on the market today. In fact, you don’t need to break a bank to afford this model and it will offer value for your money. Are you looking for an alternative to a spa? You need to try the SereneLife portable Infrared Home Spa to enjoy the best therapy. It comes with everything that you will require to enjoy the best spa experience in a comfortable environment. This portable infrared sauna is highly portable and you can move it from one place to another. You can easily pick it, pack it, and take it with you whenever you want. It is that simple and it is perfect for all users. The sauna is ideal for use after a tiring day at work since it offers you relaxation and enjoyment. What’s more, it has zippers on the sides that allow you to take out your hand and read a book or even do other activities. Unlike most portable saunas out there, this model comes with its own sauna chair. It comes with a foldable and affordable sauna chair that will last for years. With this model, you can save a few bucks since you won’t need to visit the salon for a beauty shop. Furthermore, you can relax whenever you want since it is a home sauna. Giantex is a widely used sauna that uses infrared technology to provide you with the relaxation you deserve. It offers unique features and is quite affordable – you shouldn’t worry about the price. Since it is a portable product, you can easily use it at the comfort of your home or any other place you want. With this model, you will enjoy more than a large sauna since it will also be a convenience to store. It comes with negative ion heater for heating the sauna: 3 mica heating elements and tourmaline. Great heating design offers 3 heating levels for comfortable foot pad and its temperature range from 60-140 degrees F. You can set the timer to run for 60 minutes. This model has a folding chair that allows you to relax better and a foot massager that will aid you to sweat away from the fat and toxin. Moreover, it is a lightweight model that you can carry from one place to the other with ease. It is an amazing treatment for relaxing your tired muscles and pore and will fit a grown up. Radiant Saunas BSA6315 comes while fully assembled to provide you with an easy time. It is a sturdy model that comes with EZ fit firm beech hardwood dowel frame that supports the system. The sauna features a heavy-duty portable chair that supports about 220 pounds. Therefore, it is a great product that will support a grown up with ease. Another feature of the product is the high-quality dual exterior and interior front compartment zippers which are easy to open. It also has a safe easy fingertip handheld controller with six auto timer options. This means that managing your portable sauna will be an easy process that you can do even if you haven’t used one before. The model has an UL-approved 6.5 feet electric power cord with a safe and secure Velcro cord attachment. Requiring power supply of 120V, you will find it easy to use the sauna at home. And it comes with sanitary clean air ionizer that helps to keep it clean and fresh. This is the model for you if you want a model that you can use for every day after a tiring day. 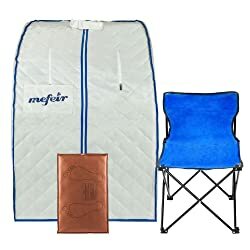 Mefeir is a highly portable sauna that is equipped with a carrying bag and a large size folding chair. You can use it for different outdoor activities including a picnic, camping, and fishing. The model is quite attractive to the eye thanks to its relatively tight design. This is not an easy to install model but you can install it when you follow the installation manual. For instance, you should install the PPV bracket before you install the cover. It comes with steamers that relieve fatigue, melts your care away, and soothes achy muscles. And you can easily adjust the temperature to set your preferred level. With this sauna, you are assured of leaving your tiring day behind and enjoy a relaxing environment. This infrared sauna features fireproof cotton that assures your safety when in the sauna. It also offers anti-explosion, anti-leakage, anti-dry, and auto power cut protection to boost security. Besides, cotton cover with water-tight layer prevents the steam from running out. 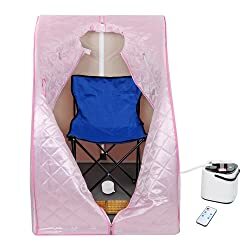 It also offers 4-layer insulation that prevents heat loss and can reach a maximum temperature of 140 degrees F.
AW Portable Large Chair is a portable sauna kit that has a steam pot, foot massager, and a chair, making it convenient for your use when you get it. Also, it comes with a detachable frame that makes it easier to store and save your limited space. Besides, the frame features joints that allow you to connect it with ease. You can easily assemble your portable sauna within 10 minutes and you don’t need to hire a professional to do this. It also provides six levels of adjustable time and nine levels of adjustable temperature to ensure that it meets your needs. Cotton cover with watertight layer prevents steam penetration. This model also comes with a carrying bag and a folding chair that makes it easier to carry from one place to the other. This means that you can use it outdoors while camping, fishing, or doing other activities. It is also an affordable product that will provide value for your money. This is also one of the most durable products on the market today. 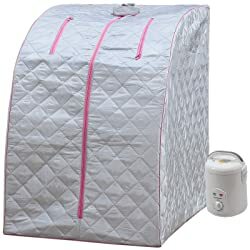 Another portable sauna that will provide you with the sauna experience you want is the DSS-404 Lightweight Personal Steam Sauna. It comes with a strong 800w steam generator that will provide sufficient power to provide the therapy you want. The other feature of the model is the timer that allows you to set the time you want to be in your sauna. You can set a maximum of 60 minutes. It is also a beautiful product that comes with a pink or blue outline and gray color tent. A convenience sauna anywhere, this model comes with all the things you will require to set it up and even use it immediately. You will have an easy time setting it up and you don’t need to look for a friend to help you to assemble it. Moreover, it is a durable product that will provide you with years of service. This means that you will find value in your money since it will be the last portable sauna you need for a long time. If a fast folding sauna is what you are looking for, then the AW 2L Portable Steam Sauna SPA is the model for you. It comes with a fast-fold spa tent that will allow you to take it out, set it up, and enjoy a great sauna experience. It also offers a one-piece compact design that allows you to store it with ease and save you trouble when disconnecting and connecting the poles. The other notable feature of the model is the cotton cover that offers waterproof ability to prevent the steam from penetrating. 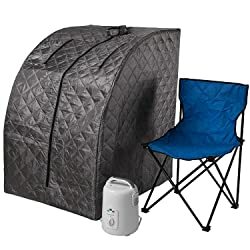 2 side holds come in handy to allow you to put your legs in the tent to allow you to enjoy a full body sauna experience or simply foot spa if that what you want. One unique feature of this model is the herbal box that allows you to put aroma essential oil or herb to enhance the effect of detox and relaxation. Overall, this is a huge sauna that will fit a grown up to ensure that you have a great time when relaxing. 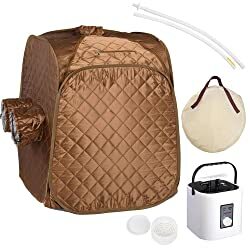 How to Use Portable Sauna? First, you need to know that temperature is very important in a sauna. The temperature can range to about 120 degrees F. Frequency of use is also quite critical in order to get the optimum benefits of your portable sauna. Also, you should remain in your sauna for about 5 minutes if you are a starter but can take over 20 minutes if you are experienced. Then, you should cool down. Repeat the process for as many times as you want. How to Fold Portable Sauna? Portable saunas vary in design but you can always fold them in the same manner. Once you have taken your model out of its carrying bag, your sauna will come to life. When you are done and it’s time to fold it, simply push it inward on any corner and press the gear flat. From there begin from one corner and fold it to a compact product. Saunas will also come with instructions on how to fold them. After folding your portable sauna, ensure that you keep it in its carrying bag to remain in top condition. Also, store your sauna in the right place – where it won’t come into contact with water to prevent mold development. How to Clean Portable Sauna? You will be excited to learn that some portable saunas can be washed with dry air machines. Others should be wiped (canopy and tent) down with a mix of water and rubbing alcohol. Besides, there are off-the-shelf cleaners that you can use to clean your portable sauna that features citrus or tree oil and can kill bacteria. Steam generators and water reservoirs can be sanitized and cleaned with these products. Again, read the manufacturer instructions to know how to clean your portable sauna. How to Clean a Portable Infrared Sauna? There is no big difference between cleaning steam and an infrared sauna. Of important, ensure that you use the right products to clean your sauna and don’t use a lot of water. These products are usually clean since they work under a high temperature that kills germs naturally. How Much is a Portable Sauna? Portable saunas are not as expensive as other models of saunas. These products go from as low as under $100 to as high as over $1,000. It will depend on the model and brand you choose. Also, the price will be determined by the features you want in your sauna. When buying a portable sauna, know what you want and how much you have budgeted for your model to ensure that you get the right one. Best portable saunas have been shown to promote physical and emotional health. They provide overall well-being of your mind and body using heat that can also help you to lose weight. Portable saunas are a great product since they allow you to carry them whenever you want, meaning that you can always have the spa experience you have always wanted.